Last year, I was commissioned by the Skirball Cultural Center to make an exhibition considering the relationship between the Mexican Muralists and Los Angeles. This was to be part of the Getty Foundation’s Pacific Standard Time: LA/LA, as was a second exhibit the Skirball was planning: an examination of the work of writer Anita Brenner, whose 1929 volume, Idols behind Altars: Modern Mexican Art and Its Cultural Roots, helped promote Mexican art and muralism to American audiences.1 Thinking of Brenner’s work alongside the six months David Alfaro Siqueiros spent in Los Angeles in 1932, teaching at the Chouinard Art Institute and creating murals there and on Olvera Street, framed my thinking about the exhibition. The result was Surface Tension: Murals, Signs, and Mark-Making in Los Angeles, a photographic journey to map out the city through its murals, signs, and mark-making, in the hopes of making visible the larger cultural, socio-economic, and political forces that have shaped the place we have come to call Los Angeles. Culled from thousands of images, the final exhibition included a selection of just over 140 photographs selected by theme, artist, and location. 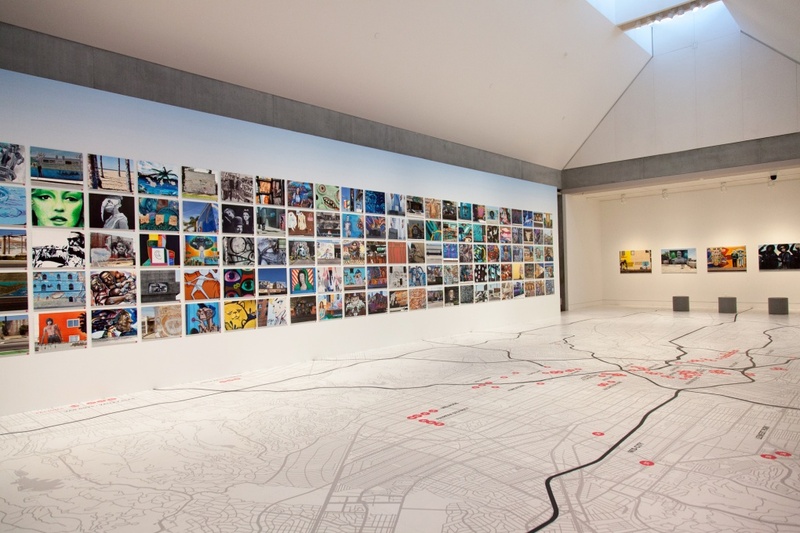 The floor in front of the images was covered with a scale map of the city showing where each mural was located, allowing viewers to imagine the city at both a micro and macro level. By doing this, I hoped viewers might see links between social movements, celebrity culture, economic forces, and the built environment. I wondered how murals and other graphic images contributed to gentrification and why some neighborhoods had many of these images while others had none. I also wanted viewers to consider vernacular hand-painted signs, graffiti, and graffiti writing as a part of muralism. And within this larger definition, I came to see murals as sites of public discourse, celebration, and mourning. The influence of the Mexican Muralists had clear links to the Chicano Mural Movement and artists like Judith F. Baca and the San Diego-based collective Congreso de Artistas Chicanos de Aztlan (CACA). In 1974, Baca began working with the Army Corps of Engineers, youth organizations, community groups, and governmental juvenile justice funding to create The History of California, a.k.a. The Great Wall of Los Angeles. And in 1978, CACA painted We Are Not a Minority as a part of the Estrada Courts murals in East Los Angeles. Their influence can be seen in later projects like RTN Crew’s The Crenshaw Wall, a.k.a. The Great Wall of Crenshaw, located in Hyde Park, or Christina Angelina and Patrick Henry Johnson’s breathtaking works in Leimert Park. These and other works have shaped our understanding of the Chicano Mural Movement for decades and continue to influence Latinx artists today. But suddenly, as I toured around the city to look at them, I began to realize how remarkable it really is that so many of these murals remain intact even after four decades. I found myself wondering how they came to be funded and, more importantly, how they came to survive. I spoke with muralists who use their own funds to keep the work up and others who rely on the communities in which they were painted. In every case, these works are under constant threat of erasure—of being whitewashed, painted over, or tagged. I began to think of all the communities and individuals that contributed to what might be thought of as a vast outdoor museum. In a city of contested spaces, Surface Tension sought to recognize that while some sites are carefully looked after and maintained, other are tagged, painted over, and lost. Taken at a macro level, the works represented reveal that muralism today is not stagnant. Graffiti, graffiti writing, tagging, public art, advertisements, wheatpasted posters, even cars and busses wrapped in vinyl graphics, expose the intersectionality all around us.We live surrounded by an even rarer beauty once we get off the freeway. There are works with multiple artists, graphic styles, collaborative and community elements, and these artworks don’t exist in the rarefied spaces of the white cube. Venice has long been the site for a less political strand of muralism, with artists like Rip Cronk and Jonas Never mixing celebrity culture and familiar icons from art history with highwire displays of virtuosity. 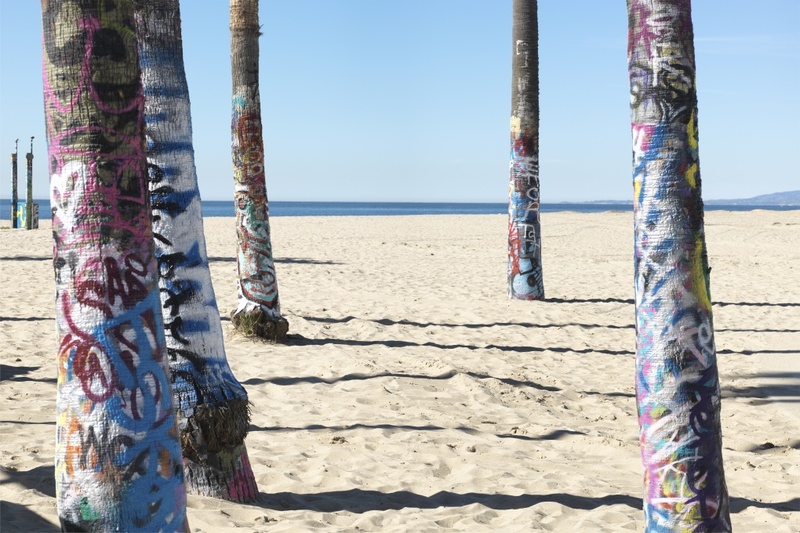 I saw an ever changing swirl of metallic paint dripping down nearby palm trees at the Venice Graffiti Walls, where a wide range of artists working as individuals and groups tagged, marked, and claimed ownership of this land of dreams. 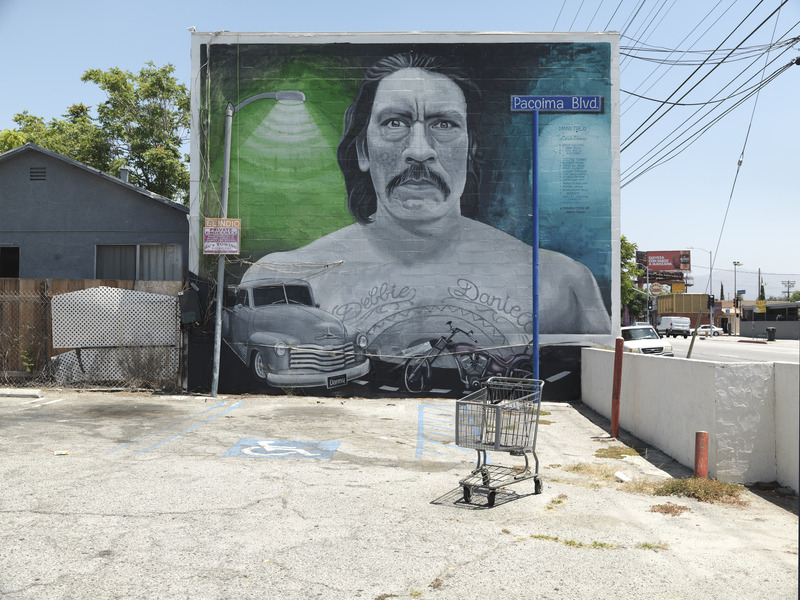 To the north, Hector, Levi, and Sarah Ponce, along with artists like Kristy Sandoval, The HOODsisters, Manny Velazquez, and MUTE, have created a “Mural Mile” in Pacoima that is reigned over by Danny Trejo and the Virgen de Guadalupe. Murals embracing civic and cultural pride can be found in Watts and the “East Los” markets, shops, and alleys that tell of the past and present, often revealing a unique blend of cultural and local dignity. Since at least the 1984 Summer Olympics, Downtown has been a visible host to much of this, from the work of Kent Twitchell and Eloy Torres to newcomers like Robert Vargas. Recently the Arts District and Skid Row have seen an explosion of murals and graphic arts by artists like Yreina D. Cervántez, Lydia Emily Archibald, El Mac, Retna, Tyko, Vyal One, among many others. 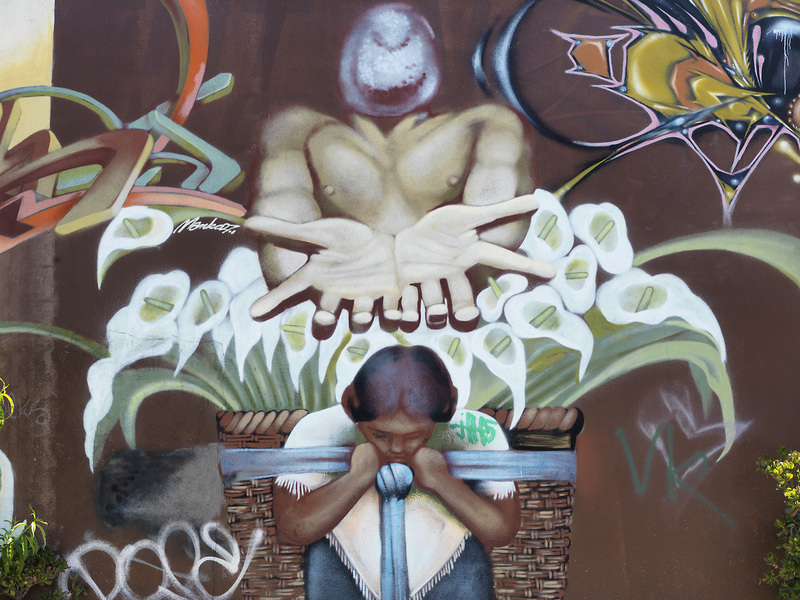 East Los Angeles has more than we can list, but some of the artists include: Zender, Nuke, Cahli, Shandu One, Paul Botello, Eva Cockroft, and Alessandra Moctezuma, who pays homage to Siqueiros. Israel Valenzuela’s murals at La Blanquita Super Market are an eye-popping fusion of vernacular and cultural imagery. Historic Filipinotown, Hollywood, and the Fairfax district each have strong mural works including the Fairfax Community Wall by Art Mortimer, with Stephen Anaya, Peri Fleischman, and community volunteers, which tells the story of the city’s Jewish history. Indeed, there are so many neighborhoods and artists there is no room to mention them all. There are murals that depict Civil Rights leaders, Feminist leaders, those lost to AIDS, artists, and activists. Other murals point to the region’s indigenous past, from ancient Aztec pyramids to the local Tongva and Gabrielino cultures. Perhaps most interesting to anyone driving across Los Angeles are the many hand-painted advertisements offering everything from tamales to washing machines. Hand-painted signs, stickers, posters, tags, and graffiti appear and disappear in waves in the liminal spaces of the city’s built environment. 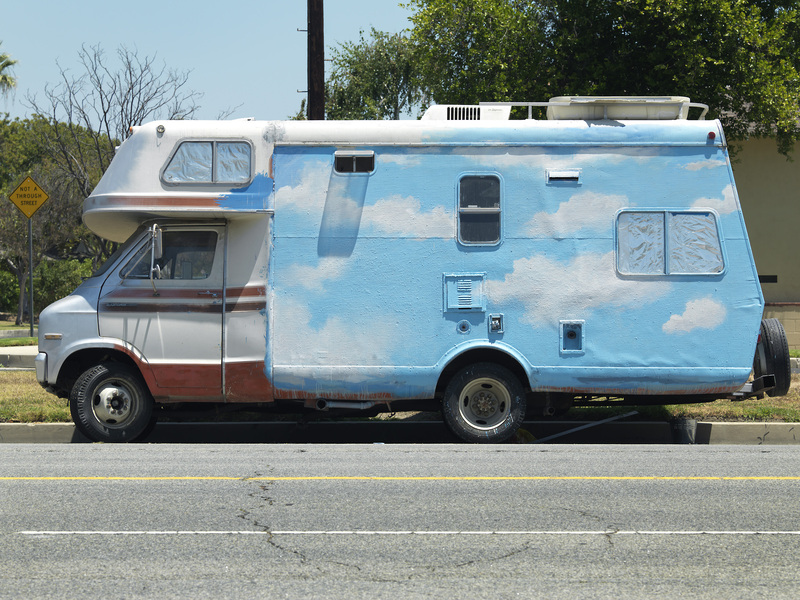 An RV painted with clouds seemed to speak to this city of dreams but may also point to the rising costs of rents and the increasing impossibility of home ownership. Murals and graphic arts do enhance neighborhoods but can also be employed as part of the economics of gentrification. I learned about muralists and graphic artists who live double lives, commissioned by corporate sponsors, private businesses, and organizations by day, and then creating unsigned, and sometimes uninvited, works by cover of night. One can find murals about the film industry, agriculture, Spanish Colonization and space exploration, not to mention at least one sighting of E.T. For me, Surface Tension was never simply about murals, it was about people, about artists and their struggle to express ideas that would otherwise go unheard or unseen. It was also about mapping and seeing the uniqueness of each neighborhood in the larger tapestry of the city. I visited memorials to those lost, to those who inspire. I saw rage, political frustration, and even resistance to gentrification in this city of contested spaces. I felt the warmth of its people, explored neighborhoods I barely knew, witnessed a strength that only community can foster, and marveled at the power of images as material celebrations and contestations of the politics of place—at a scale that few cities could muster—and I hoped the project might encourage locals and visitors alike to venture out, document, and add to our understanding of the city. Ken Gonzales-Day makes interdisciplinary and conceptually grounded projects that consider the history of photography, the construction of race, and the limits of representational systems ranging from the lynching photograph to museum display. Gonzales-Day’s photographs have been exhibited at the Generali Foundation, The Getty, LACMA, LAXART, New Museum, Palais de Tokyo, Smithsonian Institution, among others. His books include Lynching in the West: 1850-1935 (Duke) and Profiled (LACMA). Gonzales-Day is Professor at Scripps College. He is represented by Luis De Jesus Los Angeles.